Screenshot via NRA/FacebookNRATV personality Colion Noir. He also criticised the students’ age as a disqualifier for talking about gun measures. 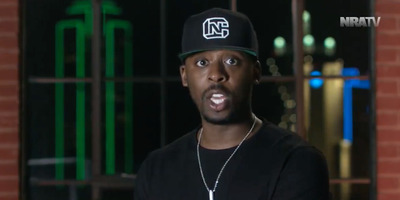 Colion Noir made an allusion to the Black Panthers in defending the NRA’s stance on guns, as well. An NRATV host levied a fresh set of attacks against the Parkland, Florida shooting survivors ahead of Saturday’s March for Our Lives protest. “To all the kids from Parkland getting ready to use your First Amendment to attack everyone else’s Second Amendment at your march on Saturday, I wish a hero like Blaine Gaskill had been at Marjory Douglas High School last month, because your classmates would still be alive and no one would know your names, because the media would have completely and utterly ignored your story, the way they ignored his,” Noir said. Noir was referencing the story of a Blaine Gaskill, a 34-year-old armed sheriff’s deputy assigned to Great Mills High School in Maryland, who stopped a shooting there this week in under a minute by engaging the gunman. Gaskill’s story was contrasted with that of deputy Scot Peterson in the Florida shooting, who was also armed but failed to pursue suspected shooter Nikolas Cruz as he went on a rampage that killed 17 people. Gaskill’s story has received mainstream news attention this week for a number of major outlets, including Business Insider, The New York Times, and CNN. Noir sharply criticised the Parkland shooting survivors ahead of the series of marches they helped organise this weekend, which drew crowds of hundreds of thousands of people in cities across the US. Noir’s attacks on the Parkland survivors are but the latest in a series of attacks on the fiery and controversial activists, which have included conspiracy theories that some of the students like David Hogg are “crisis actors” trained to push a gun control agenda. There is no evidence to support such claims. In another video posted to Facebook on the day of the nationwide rallies, Noir implicitly attacked Hogg’s and his fellow students’ young age as a disqualifier for their activism. “From where I’m standing, it looks like a march to burn the Constitution and rewrite the parts that they don’t like in crayon,” Noir said. Responding to a claim made by Hogg over the weekend that not enough black voices are featured in the gun control debate, Noir seemed to praise Malcolm X and the Black Panther movement – liberal activists who stood at the opposite end from the conservative base the NRA is a part of. “Who the hell gave David Hogg the authority to put on his white man’s burden costume to save me from myself by marching to restrict my right to own a gun that at one point I wasn’t considered human enough to own?” Noir said. “I’m fighting for the same rights Malcolm X, MLK, and the Black Panthers fought for, but because he’s a white boy talking about white privilege it’s OK for him to march on Washington to restrict your freedom,” he added. Racism against black self defence during the black power era actually inspired strict gun control laws in states like California. Meanwhile, the NRA has often stood up in defence of people like George Zimmerman, who shot Trayvon Martin, an unarmed black teenager, in Florida in 2012. The NRA was also among the groups that supported repealing open-carry laws in California in the 1960s in response to the prevalence of Black Panther organisations. In the wake of attacks on him and his friends like this one, Hogg has taken a tough stance on his critics – even addresssing NRA members directly about spokeswoman Dana Loesch.